Yep, you read that right, there are lentils in these granola bars - but don't turn away just yet, I promise that they're amazing! Canadian Lentils is holding a recipe contest for Canadian bloggers; to enter, you have to create a new and unique recipe using lentils. A few years ago, I thought that lentils were a strange, gross food that only health nuts like my sister ate. Of course, I had never actually tried them, and once I did, my opinion changed completely. Not only are lentils delicious, but they're incredibly versatile, very easy to prepare, and really good for you! I love eating lentils in the usual dishes like curries, dals, and soups, but for this contest I wanted to use lentils in a dish that wouldn't typically have them. Since I've also been wanting to make my own granola bars for quite a while now, I decided to see if I could kill two birds with one stone by trying my hand at granola bars for the first time AND incorporating lentils into them! I decided to make peanut butter granola bars because I love peanut butter, then I threw in some dates for sweetness and almonds for crunch, along with a touch of honey and vanilla for flavour. I had no idea if lentils would taste good in granola bars and I was worried that because I wasn't working from an existing recipe, they would turn out with a strange texture or taste. Well, I was wrong - they turned out so much better than I could have expected! The first time I made them, they were a little too much on the soft side, so I increased the oats the next time and they were perfect. 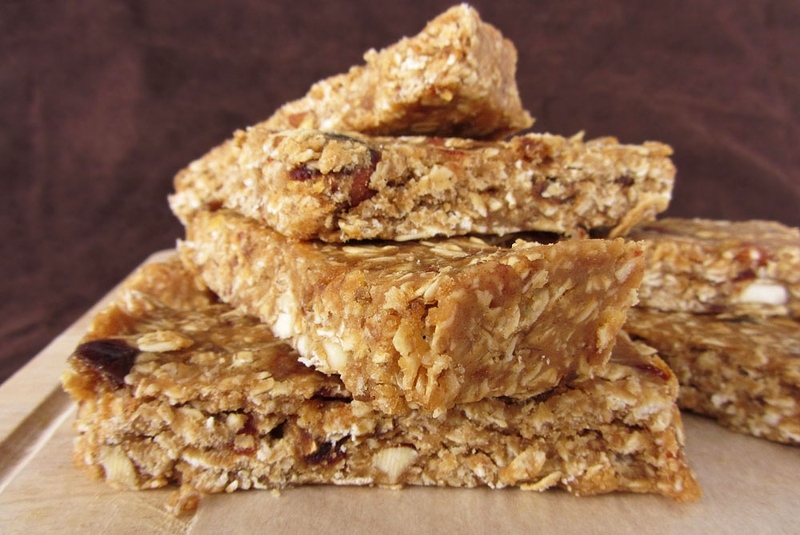 I would eat these over store-bought granola bars any day! The peanut butter is definitely the predominant flavour in these, but you also get just the right amount of sweetness and crunch from the add-ins. 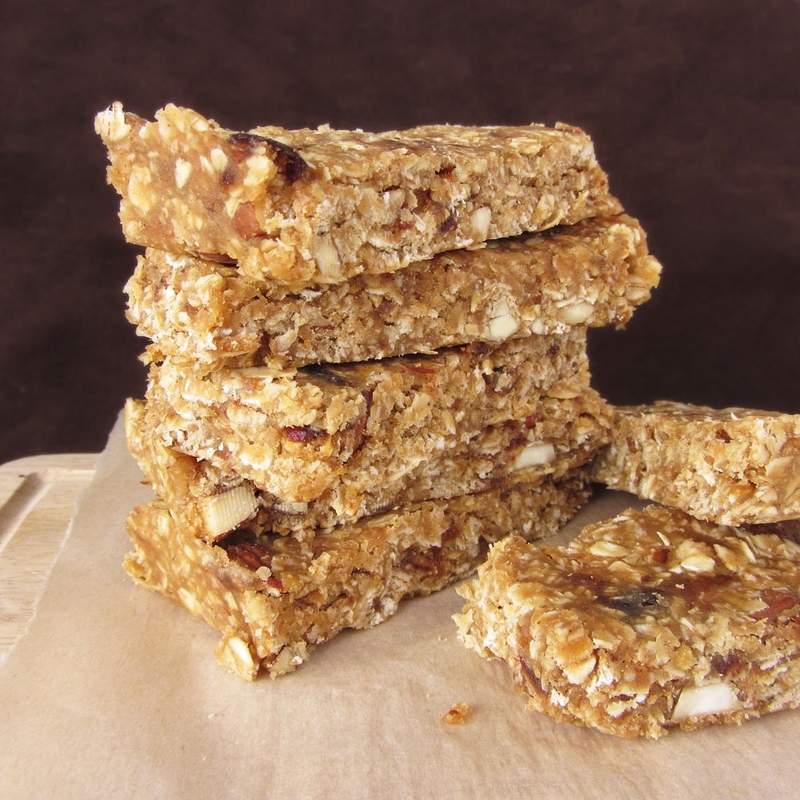 These are a soft granola bar, but they're still sturdy enough to hold up as a bar. I love the soft and chewy texture of these because it makes them so different from the dried-out, hard granola bars I often get from the store. You can't even taste the lentils in them either - I tried giving one to an unsuspecting taste-tester and she couldn't tell there were lentils in them, even after I told her they're in there. But even though you don't taste them, you still get to enjoy knowing you're getting all the benefits of lentils, including fiber, protein, and lots of other good things! The best part about these is how easy they are to make! Other than the cooking time required for the lentils (which isn't long and is hands-off), all you have to do is mix a few things in a bowl, press the mixture in a pan, and that's it! For just a little work (and not much money either), you can get a big batch of healthy granola bars to eat throughout the week! I liked these so much that I made a new batch as soon as I'd finished eating the first one, and I have a feeling I'll keep doing so for a while! I haven't experimented much with other add-ins yet, but I think there's a lot you could do with this recipe to make it suit your tastes! Back to the Canadian Lentils Recipe contest I'm entering these granola bars in, part of the judging criteria is how much of a response the post elicits from readers, so if you like the sounds of this recipe, leave a comment below - tell me about your favourite lentil recipes, granola bar recipes, or anything you want! I'd love to hear from you and you'd help me out in the contest! If you're too shy to leave a comment, you can also head over to the Canadian Lentils Facebook Page and 'like' my post on their wall - and while you're there, you can also check out all the other delicious entries in the contest! Pick through lentils to remove any debris, then place in a fine mesh strainer and rinse thoroughly in cold running water. Transfer to a medium saucepan and add 1 to 1-1/2 cups water. Bring to a boil, then cover and simmer for about 20 minutes, until the water has absorbed and lentils are cooked through. Transfer lentils to a bowl and mash with a fork (they may already be slightly mushy as red lentils don’t hold their shape as well when cooked). Let cool slightly. Add oats, peanut butter, dates, almonds, honey, and vanilla to the bowl. Mix thoroughly until well combined (you may find it easier to use your hands). 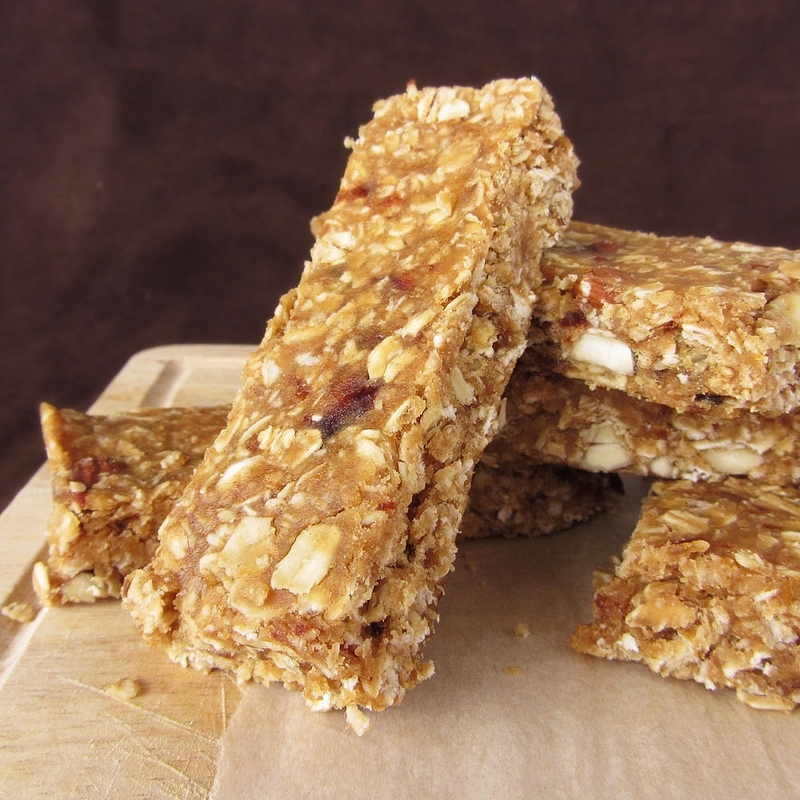 If you like sweeter granola bars, you may wish to taste the mixture and add more sweetener if desired. Line an 8x8 square baking pan with parchment paper. Transfer lentil mixture to the pan and press with your hands into an even layer. Refrigerate for at least 30 minutes, then slice into bars (cut in half, then cut each half into 5 bars). Keep bars wrapped in the refrigerator. These look great, Natalie! Definite lover of beans here and I have been meaning to try my hand at chickpea granola bars for a long time. ;) Do you think these bars would hold up well to travel and hiking in hot weather? Great idea!! I would make these for sure. Thanks, Janet! I'm not too sure how they would hold up in that situation .. I've kept some out of the fridge for a day and they do soften up a bit so I think you'd have to keep them in a container to keep them from getting squished, but I don't know if it would melt if it was in hot weather for a really long time, as there is quite a bit of peanut butter in them .. I haven't had hot enough weather to test it out! Let me know how they hold up if you do try them! Thanks, Nicole! Let me know what you think if you give them a try! I was happy to be a taste-tester as you developed this recipe! I can confirm that they were delicious - I love soft and chewy granola bars, and I loved the peanut buttery taste! Thanks, I was very happy to have an extra taste-tester too! Thanks, Courtney! Me too - I'm curious to try lentils in other baked goods now! This is unbelievable! How incredibly creative and genius of you! Another must try! My husband the health freak is going to love this! Can't wait to share! I think this is so unique and you should win. I applaud your efforts to make a good healthy treat. Oh wow, that sounds intense, good luck! 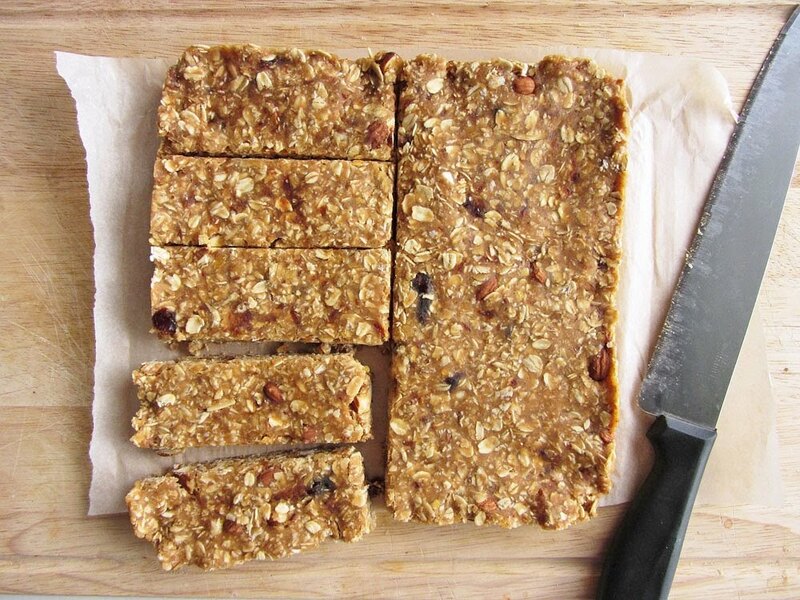 Your bars looks healthy and so good. Good luck!!! these look fantastic! i love adding lentils to foods so I must try these! Thanks, Jasmin! I hope you try them, and let me know what you think! I love this idea! I also typically use lentils in soups or rice dishes, but this is such a creative way to health-up granola bars even more! Thanks Anna - it's amazing how many ways you can use lentils, I even saw someone enter the contest with a lentil cake! I don't know if you look on Pinterest any, but I reposted this there. These look amazing. I've also been researching ways to get around the very much corrupt industry that is pregnancy in the United States. A friend sort of challenged me that it'd be near impossible for a woman to get in all the folic acid, calcium, etc., found in pricey prenatal vitamins into her diet on a daily basis. Well, this recipe makes lentils all the more palatable and easy to eat every day. Great idea; I made a few changes: added the dates, p. butter and honey (double the honey) to the just-cooked lentils and boiled a few minutes to soften the dates and incorporate them evenly. Also added dried cranberries. I didn't like the soft mushy consistancy of the bars, so I baked them about 20 min (350 degrees). Also topped with chocolate chips, returned to oven to melt; then spread over bars. Baked bars have more of a brownie-like consistancy. Great snack for teenage boy. He didn't notice the lentils. Those sound great! I'll have to try baking mine next time! I have always wanted to make my own granola and the idea of the extra protein is an added bonus. Great idea.